Children are natural foragers. They enjoy collecting, gathering, sorting and, given the opportunity, will often while away endless hours outdoors. Watch any toddler and you will see them pick up objects and explore them; usually with their mouths. Naturally this is a source of much consternation to their parents but teaching a child how to forage safely has the potential to be an enjoyable family activity that helps us to re-connect with our surroundings. 1. Never eat from a plant you cannot identify without absolute certainty. Teach your children to always check a plant with you BEFORE eating it in ALL circumstances. If in doubt, leave it out. 2. Take a good field guide with you. My favourites are listed on my blog. 3. Do not pick from land that belongs to someone without their permission. It is illegal to dig up any roots and some plants are protected so check before picking. 4. Do not strip a plant bare. 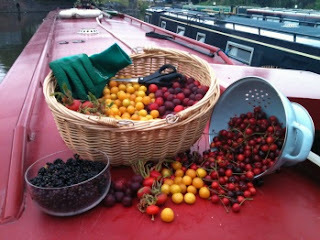 Leave some fruit for other foragers, some for other wildlife and some for propagation. Only take what you can use. These are useful principles to always bear in mind when foraging. My experience of foraging with children is that short trips, picking with a definite, preferably delicious, purpose in mind are the ideal. This may, of course, be because my children have short attention spans, but then again, the same can be said of my husband! For a first venture I would suggest picking something that everyone can recognise like elderflower, blackberries or apples. 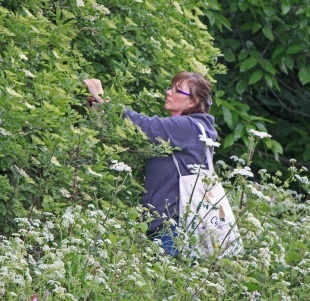 Elderflower are found from late May to early July and line the towpaths in numerous places. Blackberries are plentiful in the autumn but the wild variety can be very prickly so little fingers may get hurt. Hunting apples is lots of fun. Again, during the late summer and autumn months many trees can be found up and down the cut. If you are lucky enough to be on a stretch of canal with abandoned lockkeepers cottages then fruit trees may abound as cottage gardens run to seed. Children enjoy gathering windfalls, climbing trees, shaking branches and then cooking with their harvest. The following recipe is an excellent one for all types of children, be they 2 or 92! 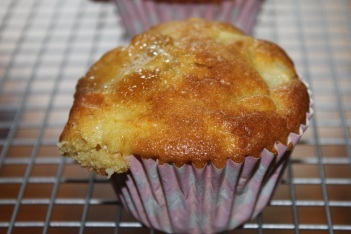 Place the margarine and sugar in a mixing bowl and beat until light and fluffy. Beat in the eggs, yogurt and milk until combined. Peel, core and chop the apple into small pieces. Sift the flour and bicarbonate of soda together and fold in to the egg mixture with apple until just blended. Chop each piece of fudge into 4 and poke into muffin mix ensuring it does not touch the sides and is completely covered. Bake for 25 mins or until a fine skewer inserted into the centre comes out clean. Leave to cool in tin for 5 mins, then turn onto wire rack to cool completely.